I have a 3″ belt drive primary drive on my 1992 Heritage. I really like the look of it and it has performed well for thousands of miles. 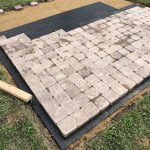 For this project I chose the 2″ open belt primary kit from Ultima. 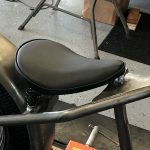 I ordered the primary belt drive set up from americanclassicmotors and I received it earlier this week. I had the day off on Friday so I mocked up the primary and final drive to make sure everything was going to line up. 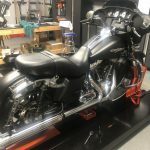 The kit comes with everything you need for installation; motor plate, pulleys, clutch plates, pressure plates, starter jackshaft, 2″ belt, and hardware. 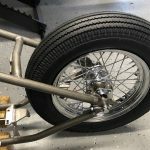 americanclassicmotors had the kit in stock and it shipped quick. 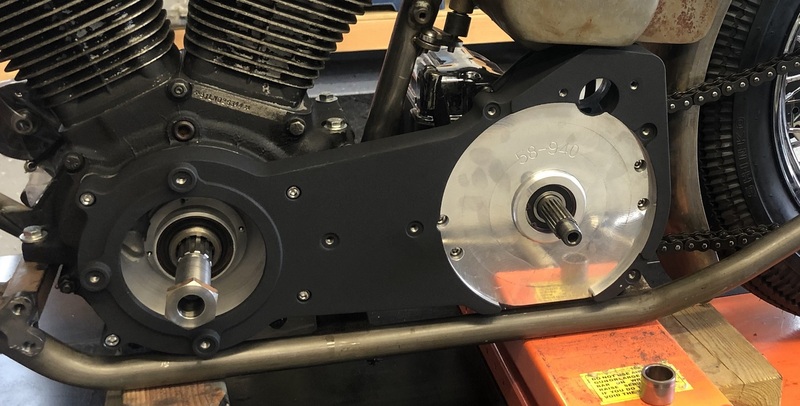 There is bearing race on the transmission mainshaft which needs to be removed to install the new motor plate for the belt drive primary. This bearing puller kit made short work of it. There is also a special tool you can pick up specifically for pulling the mainshaft bearing race, but it is an expensive single purpose tool. If I was a professional who removed these all the time the specialty tool would probably be worth the investment. The bearing puller kit worked just fine, was about half the price of the specialty tool, and will be useful for other tasks. To pull the bearing race off the mainshaft the smaller bearing splitter goes behind the race and the puller is tightened on to the mainshaft. I put a bit of oil on the end of the forcing screw which sits on the end of the mainshaft to reduce the friction there. 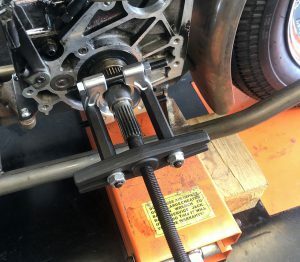 The forcing screw is slowly tightened using a 9/16 socket to pull the bearing race from the transmission mainshaft. 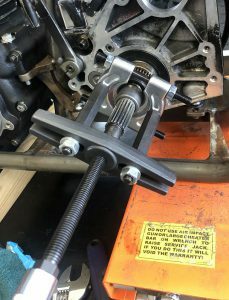 Once the bearing race was removed from the transmission mainshaft I could install the motor plate for the new 2″ primary belt drive. Everything lined up like it should – winning! 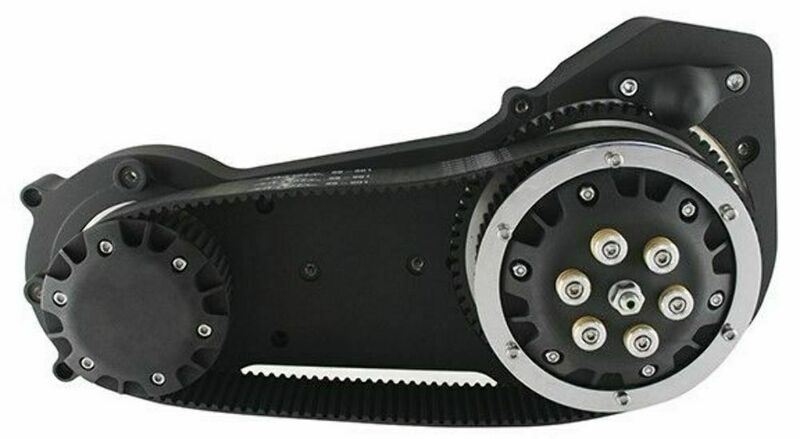 The motor and transmission frame mounts need to be loose when installing the motor plate. The motor plate is tightened to the motor first and then to the transmission. 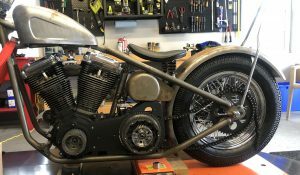 When everything is lined up, then tighten the transmission and motor mounts to the frame. When I do the final assembly there will be blue locktite on all the motor plate mounting bolts. Since I am just mocking things up and it will all have to be disassembled, no locktite. The primary motor plates and pulleys look hot on the bike. 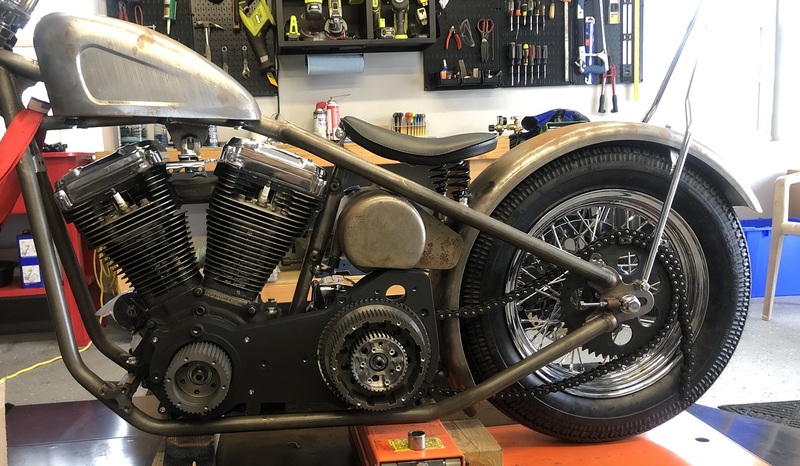 A few more minor things to do: mark the final drive chain to be cut to length, mark where I need to cut out the rear fender for the chain, tighten a few things down here and there to make sure every things lines up, and clean up some of my welds. Then I can start disassembling things so I can paint the frame.